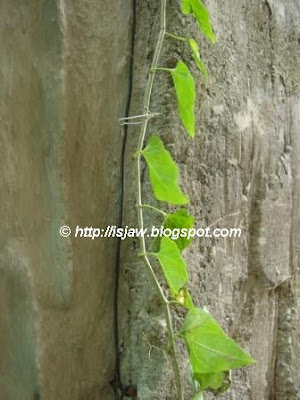 The vine will lose that horizontal growth and not achieve the nice "curtain" effect I wanted from the aerial roots. The branch crawling vertically upwards may reach the upper trellis and start clinging and grow from there. I wanted another vine to grow on that upper trellis. So how do you train a vine to climb on the trellis you want it to grow? Well, the nice thing about the Millionaire's Vine is it's a "clinging" vine as opposed to a "twining" or a "creeping" vine. It has tendrils to allow it to cling to any support. However, care must be exercised to ensure that it grows where you intend it. And so the branches need to be trained, otherwise they become wayward. Probably the simplest way is wind the vine's branch around the trellis wires. But I wanted the vine to grow ON TOP of the trellis wires. To ensure that the branches are always along the wires, I used thin tie wires as hooks. You could used hardware bought twist ties for this purpose like the one shown below. Or you could simply cut small pieces of thin wires from discarded cable wires like a telephone cable as shown in the picture below. In my case, I just used these discarded wires. I cut a few pieces roughly 2 inches long with a pair of pliers. Wind one end of the piece tightly around the trellis wire and form a hook with the other end. Carefully slide the wayward vine branch into the formed hook as shown below. There you go - an easy and inexpensive solution! When the vine was young, I also used these thin tie wires to attached them to the vertical vine support (colored black as shown below). By training the vine branches and pruning them later on as needed, you would have the perfect vine formation!